Get your groove going with the city’s joyous pop-up choir, Sing it! Seattle. Join us on Sunday, April 28th 4:00 – 5:30 PM as we learn a fantastic version of The Beatles’ classic “Lucy in the Sky with Diamonds” with all its fun harmonies. 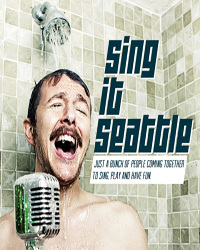 Led by a band of theatre singers and musicians, it’s open to all with no auditions. Everyone is welcome!